Published in the Dover Express, 25 July, 1980. The Emperor Severus, seventeen centuries ago, is said to have built on this spot the gate that bore his name. The connection of the Romans with this spot is a tradition, but many writers have contended that this part of the town was covered with water in the time of the Roman occupation. However, it is an undoubted fact that a gate named after Severus stood at this spot. The sea washed the foundations of this gate in the 14th and 15th centuries, and in a chamber over it was the office of the King’s Customer. In the reign of Elizabeth, adjoining the gate, on the western side, was built an imposing looking custom house, in front of which was a platform and a battery. By that time a great ridge of shingle had been thrown up in the bay, dividing from the sea the inner water called The Pent, into which vessels, a little later, could enter coming alongside the Custom House platform. To prevent the intrusion of unwelcome ships, the battery was armed with two guns, one of iron and one of brass, the latter possibly being the renowned “ Queen Elizabeth’s Pocket Pistol ’’ now in the castle. At a later date three pieces of ordnance were placed there, and it was called ‘‘The Three Gun Battery,“ a name which it retained long after it was dismantled and superseded by North’s Battery, which was built nearer the sea in 1784. 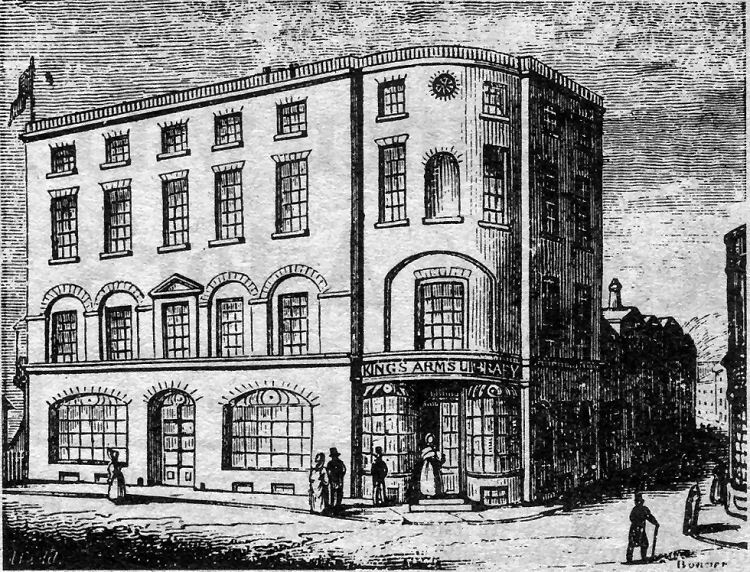 Severus Gate, and the Bench House over it, were pulled down in 1762, leaving only the foundations. The Custom House, too, disappeared, the platform and dismantled battery being then called "The Mount.“ This battery and platform being built into the town wall, was treated as Corporation property, and the townspeople, in the year 1800, being anxious to open a direct route from Bench Street to the sea, petitioned the Corporation to allow them to use the squared stones and other materials there to build a bridge to carry the road over the Dour to the beach. The request was granted, and a subscription being raised to pay for the work, the bridge was forthwith built, strongly arched, and furnished with parapets overlooking the stream on either side, thus the new century and the New Bridge were contemporaneous. There had long previously been bridges—wooden drawbridges—spanning the dyke between the town and the shingle ridge—one at Wellesley Road and another at Woolcomber Street—but New Bridge was a superior structure built to carry the traffic of a new age. The new road to the sea was at first used mainly for commercial purposes. There were no houses on the seafront then, but it was useful as an approach to the batteries, North’s and Amherst’s, which had been thrown up on the shingle, the first opposite the Granville Gardens and the second near the present Clock Tower. The way over this bridge was also convenient to reach the Ropewalk, which extended all along the shore, as well as to Messrs. Finnis's timber yards, which occupied the sites of Camden and Cambridge Terraces, and it was specially useful to the Pavement Commissioners in gathering stones and shingle from the shore to mend the town's roads. New Bridge had not existed twenty years when it was put to a nobler use. A fine crescent of houses, continually extending, had sprung up on the margin of the beach, and Dover then became the fashionable resort of the highest in the land, who, coming here to bathe in its pure waters and breathe the ozone of the sea, made New Bridge gay with the coming and going of their carriages. 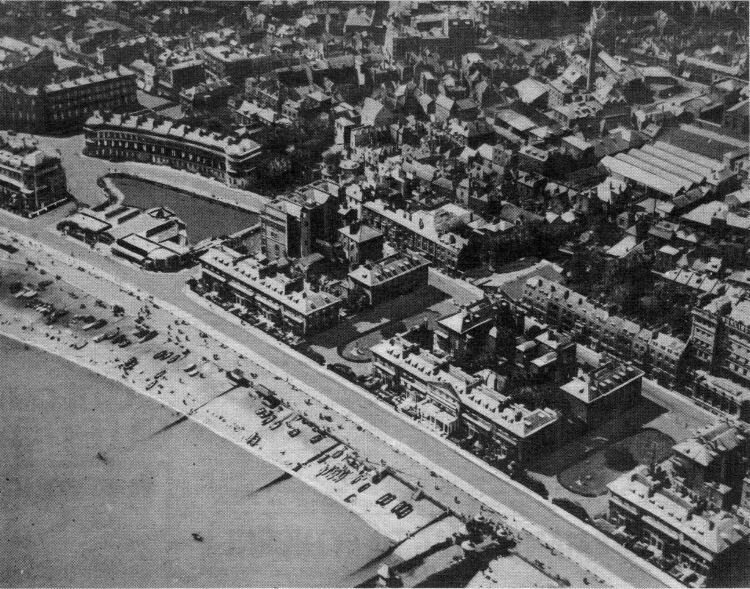 Blocks of graceful regency style houses, with Granville Gardens (left), Guilford Lawn and Clarence Lawn between them, lined Marine Parade when this aerial photograph was taken in the early 1920s. In the foreground is the Promenade Pier entrance and in the block of houses behind is the old Royal Cinque Ports Yacht Club building with a verandah. On the right, facing Clarence Lawn, is the Burlington Hotel and, at the ton of the picture is the Phoenix Brewery and the Market Square beyond. Pictured above is an 1841 print of the King’s Arms Library, at New Bridge. Taken at, or before the turn of the century, this was the view of Dover sea front and the castle from the western docks before the Prince of Wales Pier was built.